In this article I want to check the truth about the slowness of Python language when it comes to retrieving data directly from Oracle database. Second goal is to show graphically impact of changing the array size on performance, which is not possible and convenient to do with SQL*Plus. Python is widely used as the best tool for Machine Learning and AI, which are one of the most compute intensive tasks computer can solve. On the other side, Python is dynamic, interpreted language, which should mean that Python is also very slow in all CPU intensive tasks. Although fetching a data from database is more I/O intensive than CPU, I want to explore how efficient Python/cx_Oracle is when compared with SQL*Plus & SQL*Net in fetching data out from the Oracle database. From this article you can also learn how Python is convenient to test & prove some point (in this case array size). I’m using Oracle’s SH demo schema, and it’s SALES table which has almost 1 million rows. I assume you have Oracle client installed (or Instant client). If you don’t have it, you can search my blogs where I explain how to do that properly. As prerequisite you need to have Python 3+ version (I’m using 3.6), and you need to have cx_Oracle installed. All of that you can find in one of my previous articles. 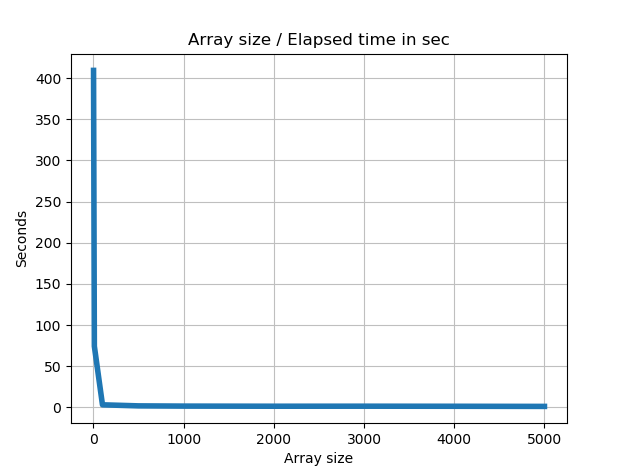 On the next two figures you can graphically see the impact of the array size. Everything else remains the same as in previous article. Here you can find numerical results to be able to compare the results with SQL*Plus & SQL*Net. If you compare Python results with SQL*Plus & SQL*Net from the previous article, results are almost identical. 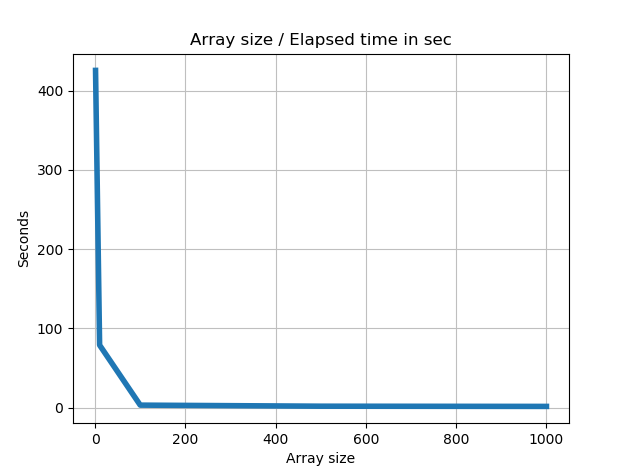 I’ve already described impact of the array size on performance. Here I added graph to visualize the results which is not convenient to do with SQL*Plus. But the main reason for writing this article is to show that performance of cx_Oracle are identical as SQL*Plus & SQL*Net combination. I’ll continue to break a myths around Python, as I’ll use it in many future articles.